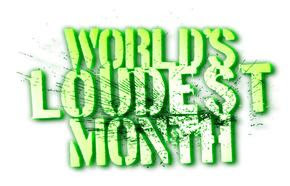 Worlds Loudest Month 2015 Dates Announced! Get ready America! The dates for the 2015 World’s Loudest Month festival series have been revealed and include the addition of the new Northern Invasion festival outside Minneapolis/St. Paul. Created by AEG Live, Danny Wimmer Presents and RockHouse Presents, The World’s Loudest Month features the biggest names in rock music performing in eight distinct U.S. concert atmospheres in April and May. Last year saw new attendance highs for the World’s Loudest Month festivals, with more than 368,000 fans turning out to see over 150 bands perform, proving that the hunger for rock and metal music in America is growing. In addition to the already established festivals taking place in Florida, North Carolina, Ohio, Oklahoma, Texas, and Missouri, the World’s Loudest Month creators are proud to introduce the newest addition to the series,Northern Invasion, which will bow as a one day, multi-stage camping festival just outside the Twin Cities of Minneapolis and St. Paul, MN. “After selling over 360,000 tickets last year for World’s Loudest Month we are constantly looking for great cities and strong markets to add to the family of festivals associated with WLM. Minneapolis has an incredible rock radio station and it’s only fitting that we bring Northern Invasion to the region as our newest destination to the World’s Loudest Month,” says Danny Wimmer, co-executive producer of the WLM series for DWP. After selling out in 2014, Monster Energy Welcome To Rockville kicks off the World’s Loudest Month and celebrates its 5th year anniversary, returning to Jacksonville, Florida April 25 and 26th. Florida’s biggest rock festival lineup will be revealed Monday, December 8, with tickets going on sale Friday, December 12. The World’s Loudest weekend includes South Florida’s Biggest Rock Festival, Monster Energy Fort Rock, Saturday, April 25 at JetBlue Park in Fort Myers, Florida–the spring training home of the Boston Red Sox–for its 3rd consecutive year after selling out last year. The full festival lineup will be released Monday, December 8, with tickets going on sale Friday, December 12. Rock City Campgrounds at Charlotte Motor Speedway will host the fifth annual Monster Energy Carolina Rebellion. In 2014, the mid-Atlantic’s biggest rock festival sold out of camping and VIP packages, and over 60,000 fans were treated to two and a half days of picture perfect weather. For the 2015 festival, layaway packages will be offered for the first time beginning Cyber Monday (December 1, 2014). Further details regarding layaway (ticket prices, camping and hotel packages) will be announced in the coming weeks, with the concert lineup to follow in early 2015. Look for details soon about this new rock and camping festival that will take place during the World’s Loudest Month. Lineup, ticket information, and camping information will be announced in December. ROTR sold out in advance for the second year in a row in 2014, with 120,000 concert-goers on-hand at Columbus Crew Stadium to experience blistering performances from 60 of the world’s hardest rocking bands on three stages over three days. In 2015, ROTR will welcome live music’s top cable channel, AXS TV, to film the weekend as part of their live festival coverage. Weekend Field GA and Stadium GA layaway tickets are on sale now at www.rockontherange.com. Also new to Rock On The Range in 2015 will be the Jack Daniel’s Old No 7 VIP Lounge which features amenities such as dedicated Wi-Fi, charging stations, private restrooms, premium food options and more. This upgrade will be available on all ticket purchases. Returning packages like the ROTR VIP Packages, Hotel and Ticket Bundles and Camping packages will go on sale Monday, November 10 at 10:00 AM ET. Details and prices for VIP, Hotel, and Camping Packages are available at www.rockontherange.com. Regular tickets will go on sale once the band lineup has been announced in early December. In May 2014, a record crowd of over 60,000 fans turned out for the eighth year of America’s Biggest Memorial Day Weekend Party featuring the best current active rock artists and classic bands at “Catch the Fever” Festival Grounds. Rocklahoma’s seat renewal process will begin on Monday, November 17, 2014 and runs through Wednesday, January 7, 2015. The renewal option is available to those who purchased a Weekend Reserved or VIP Package ticket in 2014. To renew seats for 2015, please call 866-310-2288 or emailinfo@rocklahoma.com and a team member will contact you as soon as possible. Rocklahoma’s 2015 lineup will be announced in January. River City RockFest returns to the AT&T Center in San Antonio for its third year. Look for concert lineup details to be announced soon. In 2014, nearly 20,000 were in attendance at San Antonio’s premier rock festival, with 25 top rock bands performing on four stages. Rockfest returns to Penn Valley Park in downtown Kansas City for its 23rd year. 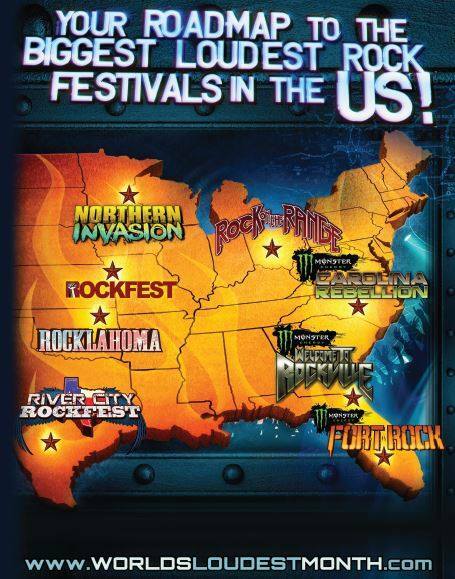 In 2014, Rockfest closed out the World’s Loudest Month festival series with over 50,000 in attendance for the seventh consecutive year of America’s largest one-day music festival. The World’s Loudest Month mobile app is available to download via iTunes and Android. Check out video highlights from WLM and ROTR! Valerie has worked as an Editor/Journalist at various major publications for over 20 years since her liver-destroying days at NYU. She's the blonde with OCD/ADHD who loves music and shiny things. Don't distract her!